So to the last day of the A-Z challenge and I’m fortunate to have the perfect castle for my choice of theme – Ashby-de-la-Zouch – the name even looks AtoZ ish. Ashby is a small town in Leicestershire, the county of my birth. The manor house was given to the Zouch family in return for their military services. The Zouch clan hailed from Breton. When the last descent died in 1399, the manor went into a protracted period of probate. It was sixty years before a new owner was established – William, Lord Hastings. Hastings was granted a licence to crenellate the manor house by Edward IV, his buddy. A licence to fortify a manor house was required between 12th and 16th centuries to ensure not just anyone could go around and build a castle without the permission of the king or one of a handful of important personages with an equivalent power. Hastings was much in favour, and appointed Lord Chamberlain, so he crenellated a handful of manors. Ashby-de-la-Zouch castle began life in 1474 and it was supposed to have four towers alongside the Great Hall and Great Tower. Only one got built – the kitchen tower – which goes to show the kitchen remains the heart of any home. Hastings also planned another castle at Kirby Muxloe, which also failed to be finished. You can see a picture under my moats post. What went wrong? Hastings was a loyal subject of Edward. Even after he married the sister of the Earl of Warwick, the kingmaker, who betrayed Edward, he stayed with the king during his brief exile. When Warwick lost his life in battle with the king, Edward boosted Hastings status even further. After the king’s death, Hastings supported the appointment of his brother, Richard, as protector of the young king Edward V. All seemed well, until suddenly a plot was uncovered and Hastings was summarily executed. Edward V and his younger brother disappeared – the Princes in the Tower – and Richard was crowned king. The conspiracy theories about Richard III continue to this day. Was he a rogue who murdered his nephews, or a victim of a subsequent smear campaign? Regardless, he did have Hastings executed and it’s possible the rise to power had tipped Hastings into going too far with his ambitions. Hastings descendants were allowed to keep the castle, which is unusual and perhaps a sign that Richard was uncomfortable with his decision. During the civil war, the Hastings sided with the Royalist cause, lost the castle during the siege and the outer fortifications were flattened. Not a lot remains. I love this picture. The aerial shot shows the earthworks left after the slighting of the castle. In hunting around for good pictures, those not from my own collection, English Heritage are the best source. So I should mention before I end my last post who they are for those who don’t know. Ruins were overseen by the Office of Works, (later the Ministry of Works), a government department set up in 1883. By the 1970s, they’d amassed over 300 monuments, including abbeys, castles and other historic sites including Stone Henge. Other than a plague on the wall and a money box for donations, they had little input into anything educational or informative. In 1983, the transformation to English Heritage began: visitor centres opened, guidebooks were provided and more information on site. By 2015, EH became a charitable trust. So if you ever want to find out more about ancient England take a look at their website. Thank you to everyone who joined me on my A to Z of castles. I hope you enjoyed it. This has been a fascinating series, well chosen and well presented. Thank you. I’m glad you enjoy the theme. I had fun researching it. Thank you for an entertaining and informative series. Hopefully, I’ll bump into you at Pevensey Castle one day – it was where the Normans landed in 1066 and originally built by the Romans. The amount of work you must have put into your pieces must have been huge, so enjoy a well-earned rest! I would love to visit Pevensey. I’ve many castles I’d still love to visit. I enjoy the research and finding out about things I’d no idea about, even for castles I’d visited. I loved every minute of the castle tours. The pictures and the history were marvelous, as was your creativity with the whole project. Thanks for working so hard on it! Thank you. It was well worth the effort given what wonderful comments I’ve out throughout the month. This has been educations and enjoyable. Congratulations on finishing the challenge. Time to relax and celebrate! Thank you. I’m going to try to keep blogging regularly, so not too much of a rest. Congratulations on your A to Z journey! I’ve enjoyed your series on Castles! That is a stunning picture of the castle. And what a life Hastings had! Congrats on making it all the way through the A to Z – I have enjoyed popping by and dipping into the world of castles, come of which I knew about, some of which I hadn’t heard of before. Thank you for popping by. I’m glad you enjoyed my theme. It was fun writing the posts. 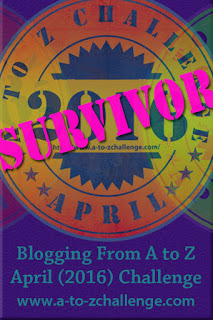 Congratulations on a wonderful A-Z Challenge! I loved the photos and information about castles. I’ve had the good fortune to visit some of them and now I’ve added more on my list to visit! Thank you for commenting. I hope you have the chance to visit a few more castles. Quite unbelievable your repertoire of castles. Enjoyed reading your posts and the breathtaking views. Thank you. There are so many more I could have written about. I was spoilt for choice! Thank you for all the great castles and all the info about them, I have really enjoyed your posts. That is indeed a lovely shot of Ashby-de-la-Zouch. It’s a wonderful aerial shot and I wish I could go up in a hot air balloon over many castles. I enjoyed your Castle theme very much. The marriage of history and fiction is outstanding. Well done! I’m really pleased you mentioned the marriage factor, I tried to bring both fact and fiction to my blog. Thank you. Another great post, not only about castels, but also about English history. And I love that picture too, it gaves an idea of what impressive building the castle must have been. Thank you. And congratulations too. I’ve learnt much about Jazz. That is a beautiful picture of the castle. Congrats on making it through the challenge! Thank you. It’s been fun.